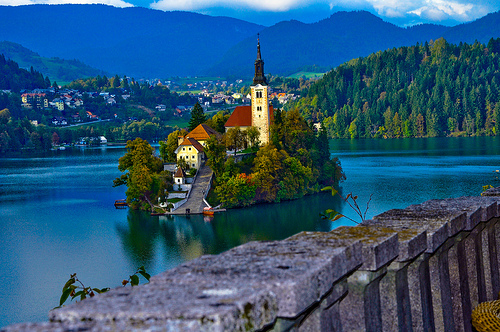 If you have ever seen a photograph of Slovenia, chances are it was a postcard of Lake Bled. Frozen in winter and used by ice skaters, the lake hosts a rowing regatta in summer, while gondola-like boats called pletna ferry people to Blejski Otok, a small island with a 17th-century baroque Church thrusting out of its often foggy waters in the middle of the alp-enclosed lake. It's possible and pleasant to walk around the lake in about one hour. A faster but touristier alternative is to ride around it in the traditional horse and carriage known as a fijaker, as Agatha Christie did when she was a regular visitor. The path circling the lake offers fantastic views of the island, the church, the castle and the town itself. It also gives you an opportunity to check the local gostilnas or restaurants that are scattered around the lake and make a decision on where to enjoy your evening meal. 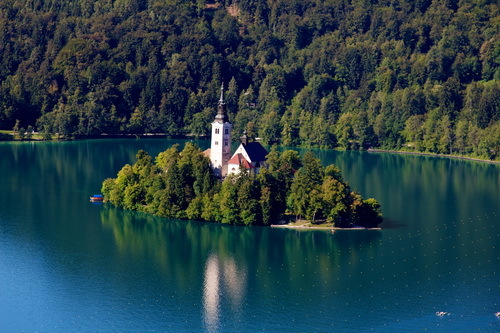 Bled's wedding-cake landscape is so immaculate that it is close to caricaturing a fairy tale illustration. 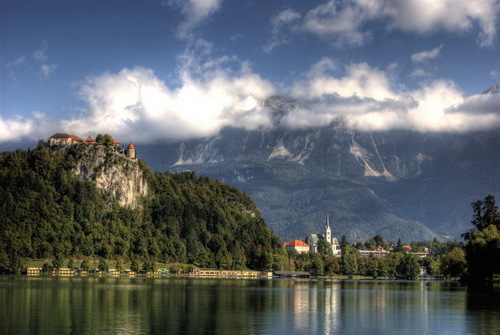 A translucent lake, with a wooded island rising from the centre and a baroque church at the top; a cliff-top castle built on a 300ft rock; thermal springs; and the dramatic Julian Alps as a backdrop. Tourism in this symmetrical extravaganza is cleverly regulated by a simple device that others under threat should follow: the number of inhabitants (5,500) can never be overtaken by the number of tourist beds. 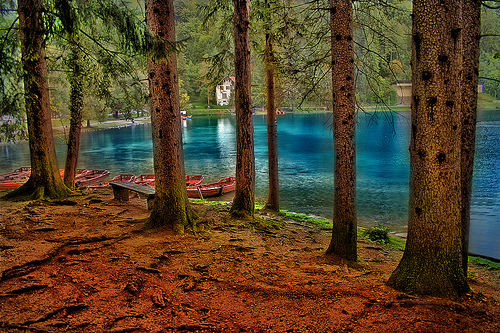 As a result, Bled is ideal for walkers who like their journeys long, short or lazy. A stroll around the lake takes just over an hour and can be neatly broken with a diversion to Tito's former summer residence, now the Hotel Vila Bled. Even shorter is the pipe-opener to Straza, on the south-east shore of the lake. Lake Bled was formed from the waters released when the Bohinj glacier melted and filled the natural basin that was formed by the glacier. Not being tributary-fed it obtains its clean water from a number of natural springs. While excavations have discovered there have been settlements on the island and around the lake since the 8th century, it took the foresight of an innovative Swiss doctor to transform Bled into the iconic destination it is today. Saving the lake from being drained to extract the rich clay deposits that comprised the lake bed for use as bricks, he foresaw the possibility of taking advantage of its unique thermal springs to develop a spa resort for the European gentry that quickly gained popularity. Framed by the Julian Alps and home to Slovenia's only island, the Blejski Otok is the perfect setting for a restful getaway. The island can only be reached by gondola-style boats called "pletnas". Once you set foot there, 99 steps await to take you up to the Chapel of St Maria. It's worth the climb and there's a quaint cafe and terrace with amazing views of the lake - a reward for all that exercise! According to local legend, a husband will be guaranteed a happy marriage if he can carry his new bride up the punishing 99 steps from the dock into the church. The small Christian baroque church on the island was first consecrated in 1142, but the present building was built in the 17th century with a freestanding bell tower. In the chapel, legend has it that if you can ring the bell just three times your wish will be answered. There are more great views from the dramatic Bled Castle perched even higher on a cliff above the lake's edge. There you can look down on the island and watch the boats - so small in the distance that they look like toys - heading back and forth to the mainland.